We have had many renditions of So That Happened on Three Man Booth. We highlighted your tweets. We spotlighted your gifs. We made hundreds of memes. But with WWE’s ever-changing landscape and today’s news quickly becoming yesterday’s afterthought, we want to do our part in recapping RAW as quickly and effectively as possible. Example: Finn Balor’s re-return and easy defeat of Curt Hawkins on RAW. But that was a practice! While there were many things that happened on RAW this week, there is one moment that sticks out. Big Show and Braun Strowman killing the ring and almost John Cone. Unfortunately for Big Show, he is no stranger to doing this. We don’t give Big Show a lot of credit, but Slim-Thick Big Show has been straight fire with his recent feud with Braun Strowman. Congratulations, Big Show! Everybody gets…two…? See you next week for another RAW moment! Also, Get Well John Cone. 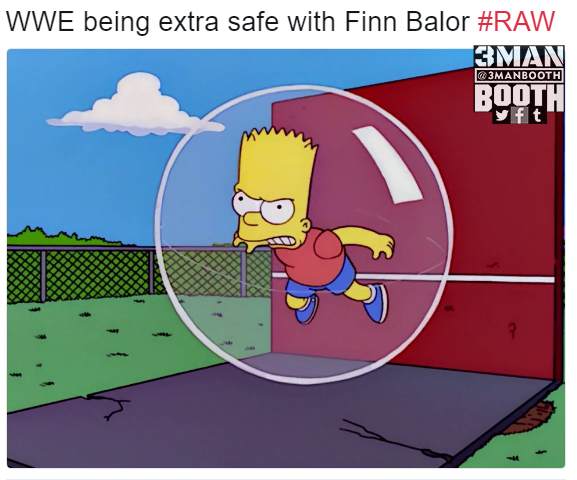 This entry was posted in So That Happened, STH, WWE, WWE RAW and tagged Alexa Bliss, Bart Simpson, Big Show, Braun Strowman, Brock Lesnar, Curt Hawkins, Finn Balor, Jinder Mahal, Mark Henry, Nia Jax, The Simpsons, WWE, WWE RAW. Bookmark the permalink.